A paranoid man, Turing devised dozens of tests to determine whether the people in his life were actual human beings. The Turing Duck Test is an assay developed by Alan Turing (1912-1954) to determine whether a subject is a human or a duck. Turing, though most famous for his eponymous Turing Test, a procedure to determine whether a subject is a man or a robot, actually devised dozens of experiments to determine whether people are, in fact, human beings. While the Turing Duck Test is rarely employed today, it did give rise to the often-misattributed Turing Hypothesis: "If it walks like a duck, and it quacks like a duck, it's a duck." For the religious among us who choose to believe lies, the self-proclaimed experts at Wikipedia think they have an article about Turing Test. 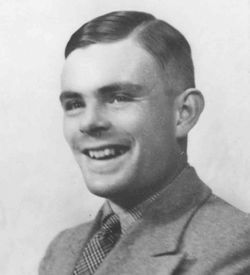 In the autumn of 1949, Turing devised an experiment to determine the validity of his hypothesis. He decided that his experiment must be double-blind, meaning that neither the experimenters nor the subjects knew they were taking place in an experiment. To that end, Turing recruited two subjects - Jeremy Robin, a first year student at Cambridge University, and "Paco," a white duck from a local pond - in such a way that neither had any idea they were being experimented upon. He also recruited a student from the Cambridge Psychology Department to make simple observations, with the instruction that they must include no references to humans or ducks. The results of the assay were a complete success: Turing found that, employing the Turing Duck Test, he was easily able to distinguish between the human being and the duck. Subject A: Subject walks in a bobbing motion about the room. Subject occasionally flaps its wings, ruffles its feathers, and scratches under its wings with its beak. Subject occasionally pecks at the floor. Subject B: Subject struggles furiously with its handcuffs and tries to wriggle out of the black mask placed over its head. After several minutes, subject collapses to the floor, curls into a foetal position, and shakes as though sobbing. Subject A: Quack. Quack. Quack. Quack. Quack. Quack. Quack. Quack. Quack. Quack. Quack. Quack. Quack. Quack. Quack. Quack. Quack. Quack. Quack. Quack. Quack. Quack. Quack. Quack. Quack. Quack. Quack. Quack. Quack. Quack. Quack. Quack. Quack. Quack. Quack. Quack. Quack. Quack. Quack. Quack. Quack. Quack. Quack. Quack. Quack. Quack. Quack. Quack. Quack. Quack. Quack. Quack. Quack. Quack. Quack. Quack. Quack. Quack. Quack. Quack. Upon grudgingly accepting his £5 and small bag of popcorn, Jeremy Robin was returned to the building from which he was recruited. At the conclusion of the test, in accordance with Cambridge's ethical guidelines, the two subjects were debriefed and it was explained to them that they had taken part in a scientific experiment. Each subject was then thanked for his or its contribution to science and remunerated with five pounds sterling (which were a lot o' money in them days) and a small bag of popcorn. Upon reviewing the data and comparing it against known behaviors and speech patterns of ducks and humans, Turing determined that Subject A was Paco the duck and that Subject B was Jeremy Robin. Turing then consulted the Psychology student's notations and found that his determination was correct. This proved both the validity of the Turing Hypothesis and the utility of the Turing Duck Test. Turing's research was published in the Philosophical Transactions of the Royal Society the following year, to the great delight of England's behaviorists (then a nascent field) and psychoanalysts. A flowchart detailing the Turing Duck Test. In recent times, researchers have undertaken attempts to defeat the Turing Duck Test; conquering the test is sometimes seen as a significant milestone that will put any biologist or computer scientist on a fast track to a Nobel Prize. One of the most significant attempts took place in 1999 at the startup company RobotFridgeCleaner.com, headquartered in San Mateo, California. The company had recently received six million dollars from venture capitalists in Taiwan, but after four months of trying to develop revolutionary new cleaning products for robotic fridges, consultants informed them that the market for such products was too small to justify the existence of the company. Faced with this news, their CTO, Manny Goldman, decided to devote the company's remaining $450,000 to finally foiling the Turing Duck Test. Goldman felt that the Turing Duck Test could best be overcome if he employed both a human who walked and quacked like a duck and a duck that neither walked nor quacked like a duck. A purist, Goldman insisted on Turing's original "double blind" methodology, and recruited his subjects in such a manner that they did not know they were taking part in an experiment. Goldman's subjects were a mallard duck poached from a local park and affectionately named "Turing," and Ralph Michaels, a transient who was found drinking Old Crow under a bridge. Subject A: Subject stumbles around the room unsteadily with its knees bent and its fists under its armpits. Subject flaps its elbows. I think the subject is doing a chicken dance. Subject smacks its shin into a bench. Subject hops around the room holding its shin. Subject shakes its fist at the camera, makes an obscene gesture, and leaves. For a time, "Turing" the duck neither walked like a duck nor quacked like a duck. Subject B: Subject lies on the floor with a large dart protruding from its neck. After thirty minutes, subject unsteadily clambers to its feet. Subject walks around the room, bobbing its head and ruffling its feathers. Subject scratches under its wing with its beak. Subject tucks its head under its wing and goes to sleep. Quack. Quack. Quack. Quack. Quack. Quack. Quack. Quack. Quack. Quack. Quack. Quack. Quack. Quack. Quack. Quack. Quack. Quack. Quack. Quack. Quack. Quack. Quack. Quack. Quack. Quack. Quack. Quack. Quack. Quack. Quack. Quack. Quack. Quack. Quack. Quack. Quack. Quack. Because RobotFridgeCleaner.com was already five million dollars over budget, Michaels and Turing the duck could not be compensated in cash. Instead, each were awarded six million stock options in the company. Upon reviewing his notes, Goldman was forced to reluctantly admit that it was somewhat obvious that Subject A was Michaels and Subject B was Turing the duck. To this day, the Turing Hypothesis has yet to be falsified, and the Turing Duck Test has never been defeated. Even so, most transhumanists believe that humanity will accomplish this feat by, at latest, the year 2050. This article was one of the Top 10 articles of 2008 (ish). This page was last edited on 5 October 2012, at 05:11.